Yesterday we held another focus group with women to help develop the State of Women’s Health in Leeds report. 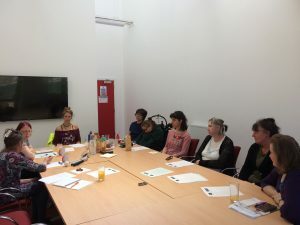 7 women attended the session to discuss the challenges they face around their health and well being, and in particular the challenges they face as disabled women in accessing health care and support. Many of the key themes of the discussion were similar to those identified in previous sessions – communication, information and choice. The women particularly highlighted the additional difficulties they face in accessing services and facilities that are appropriate for their needs. The women were passionate about the need for information to communicated in a variety of formats in order to suit the diverse needs of women in Leeds. Audio files and easy-read formats were identified as 2 formats that are currently inconsistently used by services but that would make a big difference in making information accessible if used consistently and appropriately. They also identified that services are often not equipped with the appropriate facilities to allow them to access the service. GP surgeries offer screening tests but in some cases did not have the facilities in order to carry these out for a woman who is physically disabled. 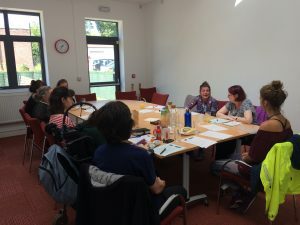 The group were very conscious that there are many challenges within the NHS currently which contribute to access issues, but felt that more could be done to ensure that they have a good experience when accessing the service. This is just a brief overview of the amazing insight that the women shared. We used dictaphones to record the session and these have now gone to Leeds Beckett University for transcription. A huge thank you to the women for coming along and sharing their thoughts, it is invaluable information that will inform the report, and hopefully will influence the future of services for women in Leeds.